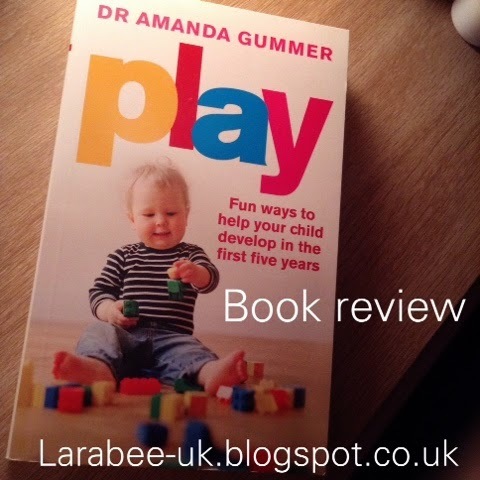 I was recently asked if I'd like to review a new parenting book called 'Play' by Dr Amanda Gummer. I must say I was a little dubious, I've got a bit of a thing about parenting books especially written by non-parents, I did some research and decided I'd give it a go. I should note, I am unaware of Dr Gummers family situation and any comments below are not directed at her, they are just to add context to my situation. The reason I'm not keen on parenting advice from non-parents is that I feel that they don't understand the emotional side of parenting, working women face. I know for sure that if I'd have been a sahm, I'd have been much more strict with our 2 main 'problem areas' T's sleeping habits and his attachment to his bottle, but as a working mum I struggle with the emotional side of upsetting him before bed and during the night. I know it's guilt and I know it doesn't help, but the guilt of not being with him all day is there and someone who isn't a parent will be detached from that. Before I had T I could easily have sat and let someone else's child 'cry it out' or said no to something if I knew it was for the greater good. Ask me to do that for my own son - no-way! I actually read the book backwards, I started reading from the 'Social development (3-4 years)' chapter, at first not really intending on reading the earlier years chapters, we don't intend to have more children so I thought it was irrelevant to be honest. I ended up reading the whole book though, as I was totally hooked. I honestly was dubious about this one, but it's just fabulous, I love Dr Gummer's easy writing style and lots of points are bulletpointed and in short paragraphs, perfect for a busy, easily distracted mum! I love how it gives you a feel for how your child is doing in terms of their learning and the fact that (of course) it's ok to use technology to help your child develop, as long as it's not used as a 'babysitter'. I found the 'play diet' section to be really interesting and have certainly given T more free play time at weekends, where we'd usually have planned activities. I know this was difficult for H was he was younger, his school was so regimented from a young age that he didn't have a clue what to do if you didn't plan with him, he just sat there, we always gave him something to do so he didn't have to think for himself, I now know that was the wrong thing to do so won't make the same mistake with at. I specifically wanted to find out more about dealing which tantrums, and although it doesn't really give advice as to how to manage tantrums it does give some great tips on page 130 on how to avoid tantrums, which I've been trying out and we've had a bit of luck with. This was in the age 2-3 section, so you see why it was important to me to re-read the start after I'd read the age appropriate chapters! At the end of each chapter, there are 10 ways to play with your child and an area to record memories. I really wish I'd have had this book when T was a newborn, I think it would have given me greater confidence in his learning. All in all, I was hugely surprised at how much I enjoyed this book, I managed to read it in a week, which at the moment is great for me and shows how captivating it was! Personally I think this is a must have for any new parent, I'll be giving a friend with a newborn a copy that's for sure. Play is available to pre-order though Amazon and will be published on 7 May. 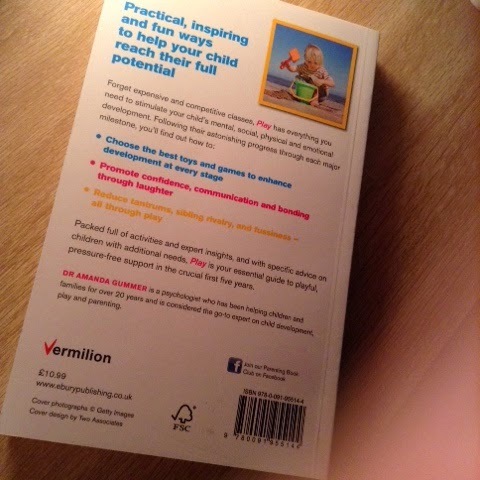 The paperback version is £10.66 and kindle £7.99. Disclaimer: I was given this book free of charge in exchange for an honest review, all opinions are my own. Thanks for your comment, it's certainly worth a read!